A dynamic new event sound design team called Panix has emerged in Germany, specifically focused on bringing the latest audio concepts and technologies to corporate and special events. With particular emphasis on audio showcontrol, imaging and spatialisation, the core team at Panix consists of partners Jorg Rapp and Stephan Diebel who founded the company in late Spring of 2013. Recent projects include the vast VW stand at the Frankfurt 2013 IAA motor show plus branding and conference events for Adidas and the Fraunhofer Institute. Both designers have previously worked on a wide range of specialist audio productions in the event sector, across a broad spectrum of premier clients and brands. Their varied palette of resources includes in-depth expertise with Pro-Tools, Q-Lab and Ableton, and they recently complemented these with the purchase of a TiMax SoundHub-48S/MADI playback server and audio showcontrol matrix. Among the services offered by Panix are overall audio design conception, strategy and creation, through to pre-production then on-site programming and management of all audio content and mixing before and during an event. Their multi-channel sound system designs are especially tailored to optimize message impact and audience immersion through the use of delay-matrix localisation techniques referred to as source-oriented reinforcement (SOR). With the help of TiMax SoundHub-S Timeline and PanSpace graphical spatialisation programming environments, their designs typically include complex 3D multichannel layered soundscapes and dynamically moving spot effects. The Adidas Global Brand 2013 Conference featured as its centerpiece a 21metre 3D projection screen. TiMax SoundHub was used to program and replay sound effects, using a combination of manual triggers and timecode to sync audio events to video content. 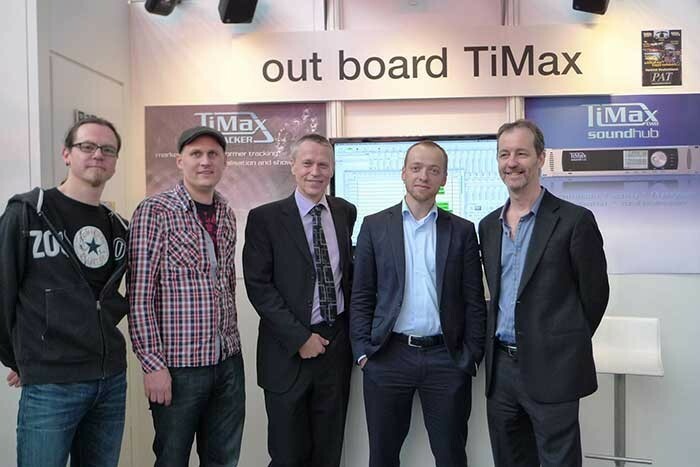 Simultaneously TiMax provided EQ, level and routing for loudspeaker system management, as well as SOR reinforcement of all mics to localise the presenters to their actual positions on stage. This helped significantly towards grabbing audience attention for the all-important brand message and to eliminate subtle stress caused by trying to work out who’s talking. Jorg Rapp comments: “Therefore the TiMax fulfilled a number of functions simultaneously and made itself out to be a very flexible tool for us.” Objectives were similar at the 2013 annual conference of the prestigious Fraunhofer Institute at the HCC Kuppelsaal in Hannover. TiMax SoundHub provided system management for approximately three-quarters of the sound systems; multichannel playback for music jingles and stings; dynamic panning of audio content to match the movements of elements in the video content; SOR vocal localisation to four separate locations in the room for different presenter and performer mics. 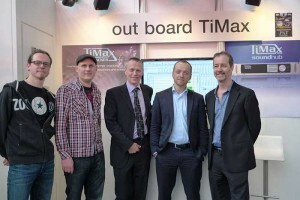 In picture: Robin Whittaker (centre) and Dave Haydon (right) of Out Board with the Panix team on stand at PLASA 2013.